For the 2018 song by Migos, see Stir Fry (song). Stir frying (Chinese: 炒; pinyin: chǎo) is a Chinese cooking technique in which ingredients are fried in a small amount of very hot oil while being stirred in a wok. The technique originated in China and in recent centuries has spread into other parts of Asia and the West. Stir frying and Chinese food have been recommended as both healthy and appealing for their skillful use of vegetables, meats, and fish which are moderate in their fat content and sauces which are not overly rich, provided calories are kept at a reasonable level. The term "stir-fry" was introduced into the English language in Buwei Yang Chao's book How to Cook and Eat in Chinese (1945), to describe the chǎo technique. During the Tang dynasty (618–907) chao referred to roasting tea leaves. Stir frying became a popular method for cooking food only later, during the Ming dynasty (1368–1644). The Chinese character "炒" is attested in inscriptions on bronze vessels from the Eastern Zhou period (771–256 BC), but not in the sense of stir frying. Dry stirring was used in the Han dynasty (206 BC – 221 AD) to parch grain. Although there are no surviving records of Han dynasty stir frying, archaeological evidence of woks and the tendency to slice food thinly indicate that the technique was likely used for cooking. The term chao appears for the first time in the sense of "stir frying" in the Qimin Yaoshu, a sixth-century agricultural manual, including in a recipe for scrambled eggs. In sources from the Tang dynasty (618–907), chao refers not to a cooking technique, but to a method for roasting tea leaves. It reappears as a cooking method in a dozen recipes from the Song dynasty (960–1279). The Song period is when the Chinese started to use vegetable oil for frying instead of animal fats. Until then, vegetable oil had been used chiefly in lamps. Historically, stir frying was not as important a technique as boiling or steaming, since the oil needed for stir frying was expensive. The technique became increasingly popular in the late Ming dynasty (1368–1644), in part because the wood and charcoal used to fire stoves were becoming increasingly expensive near urban centers, and stir-frying could cook food quickly without wasting fuel. "The increasingly commercial nature of city life" in the late Ming and Qing (1644–1912) periods also favored speedy methods. But even as stir frying became an important method in Chinese cuisine, it did not replace other cooking techniques. For instance, "only five or six of over 100 recipes recorded in the sixteenth-century novel Jin Ping Mei are stir fry recipes and wok dishes accounted for only 16 percent of the recipes in the most famous eighteenth century recipe book, the Suiyuan shidan". By the late Qing, most Chinese kitchens were equipped with a wok range (chaozao 炒灶 or paotai zao 炮臺灶) convenient for stir-frying because it had a large hole in the middle to insert the bottom of a wok into the flames. Stir frying was brought to America by early Chinese immigrants, and has been used in non-Asian cuisine. Roughly speaking, ch'ao may be defined as a big-fire-shallow-fat-continual-stirring-quick-frying of cut-up material with wet seasoning. We shall call it 'stir-fry' or 'stir' for short. The nearest to this in western cooking is sauté. ... Because stir-frying has such critical timing and is done so quickly, it can be called 'blitz-cooking.'" In the West, stir fry spread from Chinese family and restaurant kitchens into general use. One popular cookbook noted that in the "health-conscious 1970s" suddenly it seemed that "everyone was buying a wok, and stir frying remained popular because it was quick." Many families had difficulty fitting a family dinner into their crowded schedules but found that stir fry could be prepared in as little as fifteen minutes. Broadly speaking, there are two primary techniques: chao and bao. Both techniques use high heat, but chao adds a liquid and the ingredients are softer, where as bao stir fries are more crispy because of the Maillard reaction. Ingredients are typically added in succession after cooking oil has been applied onto a hot pan. The ingredients that take longest to cook, like meat or tofu, are added before others, such as vinegar and soy sauce. 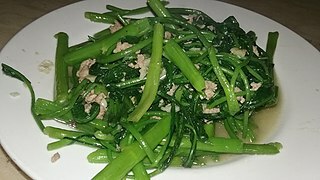 The chao (炒) technique is similar to the Western technique of sautéing. There are regional variations in the amount and type of oil, the ratio of oil to other liquids, the combinations of ingredients, the use of hot peppers, and such, but the same basic procedure is followed in all parts of the country. First the wok is heated to a high temperature, and just as or before it smokes, a small amount of cooking oil is added down the side of the wok (a traditional expression is "hot wok, cold oil"), followed by dry seasonings such as ginger, garlic, scallions, or shallots. The seasonings are tossed with a spatula until they are fragrant, then other ingredients are added, beginning with the ones taking the longest to cook, such as meat or tofu. When the meat and vegetables are nearly cooked, combinations of soy sauce, vinegar, wine, salt, or sugar may be added, along with thickeners such as cornstarch, water chestnut flour, or arrowroot. 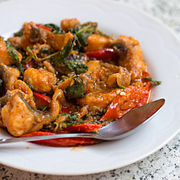 A single ingredient, especially a vegetable, may be stir-fried without the step of adding another ingredient, or two or more ingredients may be stir-fried to make a single dish. Although large leaf vegetables, such as cabbage or spinach, do not need to be cut into small pieces, for dishes which combine ingredients, they should all be cut to roughly the same size. The second character is transliterated as qi (chi according to its Mandarin Chinese pronunciation, so wok hei is sometimes rendered as wok chi in Western cookbooks) is the flavour, tastes, and "essence" imparted by a hot wok on food during stir frying. Out of the Eight Culinary Traditions of China, wok hei is encountered the most in Cantonese cuisine, whereas it may not even be an accepted underlying principle in some of the other Chinese cuisines. To impart wok hei the traditional way, the food is cooked in a seasoned wok over a high flame while being stirred and tossed quickly. The distinct taste of wok hei is partially imbued into the metal of the wok itself from previous cooking sessions and brought out again when cooking over high heat. In practical terms, the flavour imparted by chemical compounds results from caramelization, Maillard reactions, and the partial combustion of oil that come from charring and searing of the food at very high heat in excess of 200 °C (392 °F). Aside from flavour, wok hei also manifests itself in the texture and smell of the cooked items. Bao stir frying involves high heat combined with continuous tossing. This keeps juices from flowing out of the ingredients and keeps the food crispy. In the eighteenth and nineteenth centuries, the bao technique (Chinese: 爆; pinyin: bào; literally: 'pop, explosion') of stir-frying on a high flame was typical of cuisine from the northern Chinese province of Shandong. 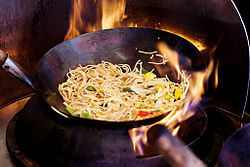 The wok is first heated to a dull red glow over a high fire. The oil, seasonings, and meats are then added in rapid succession. The food is continually tossed, stopping only to add other ingredients such as broths, vegetables, or more seasonings. The purpose of Bao is to highlight natural tastes, so minimal seasoning is added. Because of the high heat, bao is ideal for small amounts of food that cook quickly, so the juices do not flow out of the items. Meat is coated with egg white or starch in order to contain the juices. When the food is cooked it is poured and ladled out of the wok. The wok must then be quickly rinsed to prevent food residues from charring and burning to the wok bottom because of residual heat. A larger amount of cooking fat with a high smoke point, such as refined plant oils, is often used in bao. The main ingredients are usually cut into smaller pieces to aid in cooking. Stir frying can affect the nutritional value of vegetables. Fat content is increased because of the additional oil, and anti-oxidants are preserved better than by boiling. Stir frying has been promoted as healthy and nutritious. Writers extolled the quick cooking at high heat for retaining color, texture, and nutritional value. A study by researchers at the Department of Food Science and Nutrition at Zhejiang University compared the effects of boiling, steaming, and stir frying on bamboo shoots. Boiling and steaming decreased the amount of protein, soluble sugar, ash, and total free amino acids by more than one third. Stir-frying bamboo shoots increased their fat content by 528.57% due to the addition of oil, but retained more of the anti-oxidant capacities. With 78.9% retention, stir frying preserved significantly more vitamin C than boiling. Taking into consideration the total retention of antioxidants, the study concluded that stir frying is the method best suited for bamboo shoots. Similar results were found for stir frying red peppers. Another study from Zhejiang University examined the nutritional value of broccoli after five common cooking techniques; steaming, boiling, microwaving, stir-frying and stir-frying followed by deep frying. 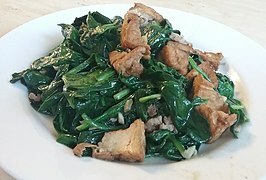 The study found that the two most common methods of home cooking in China, stir-frying and stir-frying combined with deep frying in soybean oil, resulted in a much greater loss of chlorophyll, soluble protein, soluble sugar and vitamin C. The method which affected these values the least was steaming. Stir frying for five minutes and stir frying combined with boiling caused the highest loss of glucosinolates which according to this study are best preserved by steaming. A study performed by the Spanish National Research Counsel stir fried the broccoli for only 3 minutes 30 seconds and found that nutritional value of these broccoli samples varied depending on which cooking oil was used. Comparing these results to an uncooked sample, the study found that phenolics and vitamin C were reduced more than glucosinolates and minerals. Stir-frying with soybean, peanut, safflower or extra virgin olive did not reduce glucosinolates, and broccoli stir-fried with extra virgin olive oil or sunflower oil had vitamin C levels similar to uncooked broccoli. These levels were significantly lower with other edible oils. Stir frying is not without health risks. 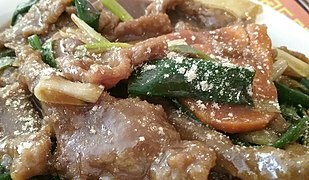 Recent studies show that heterocyclic amines (HCAs) and polycyclic aromatic hydrocarbons (PAHs) are formed by stir frying meat at very high temperatures. These chemicals cause DNA changes that may contribute to increased risk of cancer. The process of stir-frying is used in the preparation of some Chinese herbal medicines under the term 'dry-frying'. Stir frying a medical herb with honey is commonly used to increase its sweetness and therefore its spleen and stomach qi tonic effects. Stir frying in vinegar is typically used whenever one wants to direct the properties of an herb more to the liver based on the principle that the sour taste belongs to the liver. 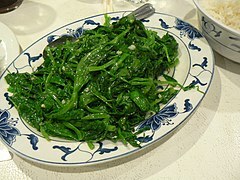 A dish of Chinese-style stir-fried spinach with tofu, also referred by some as "Golden White Jade and Green Parrot" (the deep-fried tofu and spinach represent jade and green parrot respectively). A dish of Chinese stir-fried Ginger and Onion Beef. ^ a b c d e f g Wilkinson 2012, p. 459. ^ Anderson (1988), p. 138, 188. ^ Institut Ricci 2001, p. 257. ^ Anderson (1988), p. 188, 52. ^ Newman 2004, p. 5. ^ Anderson (1988), p. 188. ^ Merril D. Smith (9 January 2013). History of American Cooking. ABC-CLIO. p. 65. ISBN 978-0-313-38712-8. ^ Hsu, Madeline (10 February 2014). "Domesticating Ethnic Foods and Becoming American". Not Even Past. Retrieved 7 July 2014. ^ Parkinson, Rhonda Lauret (2007). "The Everything Stir-Fry Cookbook". The Everything Stir-Fry Cookbook: 300 Fresh and Flavorful Recipes the Whole. Adams Media. pp. vii. Retrieved 7 July 2014. ^ Klosse 2010, pp. 131–132. ^ "Chinese cooking method — Stir-Frying". www.hugchina.com. Retrieved 5 July 2014. ^ Newman (2004), p. 73, 90, 93, 95. ^ a b "What does Wokhei mean?". Wokhei. Archived from the original on 21 October 2011. Retrieved 4 March 2012. ^ Harpham, Zoė (2002). Essential Wok Cookbook. Murdoch Books. ISBN 978-1-74045-413-1. ^ a b "Chinese Cooking Techniques". www.flavorandfortune.com. Retrieved 2016-02-23. ^ Klosse 2010, p. 131. ^ Zhang, Jin-jie; Ji, Rong; Hu, Ya-qin; Chen, Jian-chu; Ye, Xing-qian (4 September 2011). "Effect of three cooking methods on nutrient components and antioxidant capacities of bamboo shoot (Phyllostachys praecox C.D. Chu et C.S. Chao)". Journal of Zhejiang University SCIENCE B. 12 (9): 752–759. doi:10.1631/jzus.B1000251. PMC 3167909. PMID 21887851. ^ Hwang, IG; Shin, YJ; Lee, S; Lee, J; Yoo, SM (December 2012). "Effects of Different Cooking Methods on the Antioxidant Properties of Red Pepper (Capsicum annuum L.)". Prev Nutr Food Sci. 17 (4): 286–92. doi:10.3746/pnf.2012.17.4.286. PMC 3866734. PMID 24471098. ^ Yuan, Gao-feng; Sun, Bo; Yuan, Jing & Wang, Qiao-mei (August 2009). "Effects of different cooking methods on health-promoting compounds of broccoli". Effects of different cooking methods on health-promoting compounds of broccoli. NCBI. 10: Abstract. doi:10.1631/jzus.B0920051. PMC 2722699. PMID 19650196. ^ Moreno, Diego A. (1 June 2014). "Effects of stir-fry cooking with different edible oils on the phytochemical composition of broccoli". Effects of stir-fry cooking with different edible oils on the phytochemical composition of broccoli. Researchgate.com. pp. Abstract. Retrieved 10 July 2014. ^ National Cancer Institute (19 October 2015). "Chemicals in Meat Cooked at High Temperatures and Cancer Risk". Chemicals in Meat Cooked at High Temperatures and Cancer Risk. National Cancer Institute. Retrieved 21 October 2015. ^ Tierra L.Ac., O.M.D., Dr. Michael. "PROCESSING CHINESE HERBS". Archived from the original on 14 July 2014. Retrieved 7 July 2014. ^ "慈禧太后逃難". 批踢踢實業坊 (in Chinese). Retrieved 30 October 2017. Anderson, Eugene N. (1988). The Food of China. New Haven: Yale University Press. ISBN 0-300-04739-8. Institut Ricci (2001), Grand dictionnaire Ricci de la langue chinoise (in French), Paris and Taipei: Institut Ricci (Paris–Taipei), Desclée de Brouwer (Paris), ISBN 2-220-04667-2. Klosse, Peter (2010). "The Essence of Gastronomy: Understanding the Flavor of Foods and Beverages". The Essence of Gastronomy. CRC. Retrieved 11 July 2014. Newman, Jacqueline M. (2004). Food Culture in China. Westport, Conn.: Greenwood Press. ISBN 0-313-32581-2. Young, Grace (2014), Stir-Frying to the Sky's Edge, New York: Simon & Schuster, ISBN 978-1-4165-8057-7. Wikimedia Commons has media related to Stir frying. Look up stir in Wiktionary, the free dictionary.